Presented to Boulder City Council at their September 2nd, 2014 meeting. I’m here to speak on behalf of Better Boulder, a new organization that focuses on making Boulder a more sustainable community. We support council moving ahead with the comprehensive housing strategy; We support moving forward on both the early wins and the larger goals that have been identified. Housing is one of the largest issues our community faces – we need housing for people who work here, go to school here, and are aging here. Boulder is a wonderful place to live, but is also becoming an increasingly unequal place; we have some of the largest gaps between the rich and the poor in the country, and a large and growing achievement gap in our schools. Equity is one of our biggest problems – and adding housing, for both lower and middle income folks, is probably the single most important thing we can do to make Boulder a fairer and more welcoming place. More and more young people are interested in living in denser, more urban and livelier neighborhoods where they can meet most of their needs without having to drive very much. We should create neighborhoods that give these people options that meet their needs. And these are the people our businesses need as employees to keep our economy thriving. And, if Boulder is serious about the transportation goals set by our TMP, or our climate goals, creating a more urban fabric, with land use that focuses more on housing for people rather than cars is a critical step. The data is pretty overwhelming that per capita driving and building energy use go down dramatically in more urban neighborhoods. Finally we encourage truly inclusive outreach as you move forward. More than half of Boulder residents are renters, who often have very different interests than homeowners, and who tend not to be represented much in city processes or neighborhood groups. People who don’t have enough money to buy a home in Boulder deserve a say too. Thanks for the opportunity to speak. Staff’s memo on the housing strategy from the Sept. 2nd City Council meeting on the housing strategy. 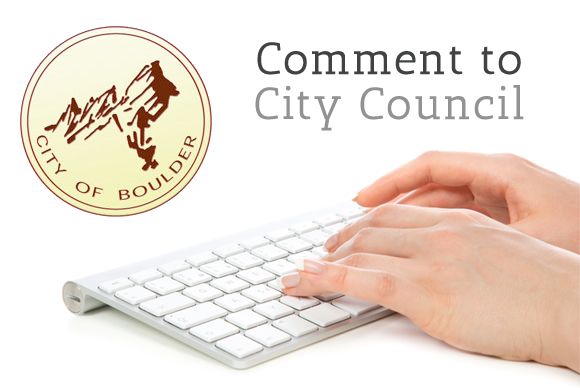 Give the city feedback on housing issues online, through the end of September, 2014. More background on housing issues in Boulder, and the ongoing process.